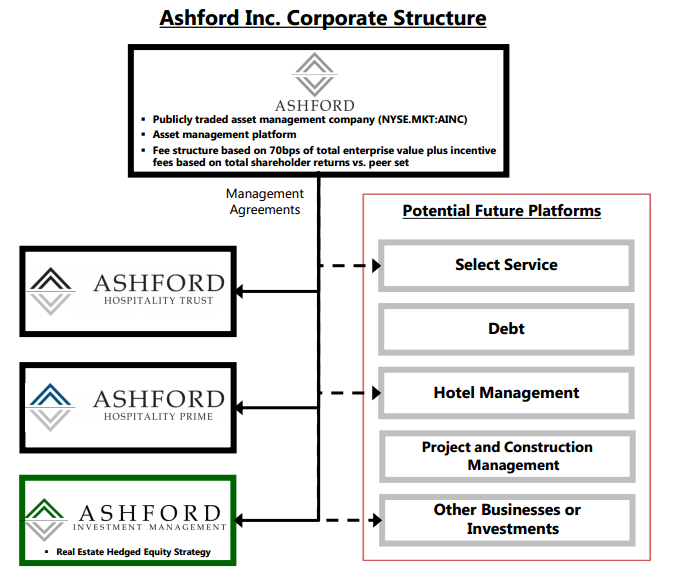 Ashford Inc (AINC) is the asset management spinoff of Ashford Hospitality Trust (AHT) that a reader recently alerted me to, so I did some digging and while I don't think it's particularly appealing at current levels, it could provide some insight into similar upcoming spins/breakups at American Capital Ltd (ACAS) and Prospect Capital (PSEC), both BDCs, which are also spinning off their asset management businesses. Most corporate governance groups and investors would prefer to see REIT/BDCs internalize management, but now there is this new trend to externalize management with asset management spinoffs, not something that happens at market bottoms. External asset managers have a number of potential conflicts with the entities they manage, what's good for AINC shareholders (AUM growth) may not be best for AHT shareholders if they end up over paying for growth or issuing shares/debt at less than ideal levels. In November 2013, AHT spun-off its luxury hotels into a separate entity Ashford Hospitality Prime (AHP) in an effort to obtain a premium valuation and a lower cost of capital. As part of the AHP spinoff, AHP entered into an external management agreement with a subsidiary of AHT which laid the groundwork for the AINC asset management spinoff. Ashford Inc (AINC) was then spun-off on 11/12/14 with an odd 1 share of AINC for every 87 shares of AHT ratio, it started trading in the mid-$40 and quickly traded all the way up to over $130 (quick triple for some) a share with CEO Monty Bennett buying in the open market along the way. It's now trading around $93. Asset management companies are of course great businesses, they have substantial operating leverage with minimal capital expenditures, a small increase in AUM can disproportionately increase earnings in a hurry. What makes Ashford more attractive than other small cap asset managers is their capital is essentially permanent, while their market caps can certainly decrease, Ashford's REITs won't be subject to outflows like a traditional mutual fund manager in a market decline. The spinoff wasn't without some controversy, labor union UNITE HERE staged some opposition to the transaction by creating a website (http://www.unlock-ashford.org/) outlining some of the real or perceived conflicts of interest created by the structure. Ashford also instituted a poison pill that expires in March and has a staggered board, both anti-shareholder friendly, which was picked up by the Wall Street Journal on Monday. Ashford Inc is really a leveraged bet on the growth (and to an extent the performance) of both AHT and AHP as Ashford will be paid a 70bp base fee on the total enterprise value (but including cash) and an incentive fee based on the relative stock performance versus a peer group for both entities (determined annually but paid over three years), so it makes sense to analyze each briefly. AHT considers itself an opportunistic hotel investor, having a wide mandate to invest across sector subclasses and across the capital structure. It also utilizes significantly more leverage (both debt and preferred stock) than the average REIT, and is quick to refinance non-recourse mortgages to raise cash as it did recently. Management likes to tout their 19% insider ownership at AHT as a method of aligning shareholder interests, and there seems to be some truth to that as AHT was savvy during the financial crisis and was able to repurchase a substantial amount of their float at advantageous valuations. Including cash, the enterprise value of AHT is around $4.2B. AHP on the other hand is marketed as the lower risk, higher quality portfolio compared to AHT. At the time of the AHP spinoff they articulated a clear strategy of targeting hotels with RevPar (revenue per available room) of at least two times the national average and located in major gateway and resort market. AHP will also have a lower debt profile than AHT, with a target of 5x EBITDA by the end of 2015 and going forward. Ashford also recently announced a share repurchase plan at AHP, again something you wouldn't expect if you're extremely cynical about external management. They plan to sell one of their hotels and buy back shares, essentially reversing the private/public arbitrage that REITs generally exploit. Including cash, the enterprise value of AHP is around $1.4B. I didn't spend too much time on the above table (so don't trust every number), but compared to peers, both look slightly undervalued on a relative basis and not particularly expensive on an absolute basis. However, Hotel REITs are a risky bunch that should trade at a discount to other REITs, their leases are the opposite of the triple-net lease industry in that their "leases" are extremely short term (overnight) in nature, meaning in a recession earnings can evaporate pretty quickly. So it appears that the market is a little ahead of itself or expecting a lot from Ashford's hedge fund effort and their incentive fees. While I'm passing on AINC for the time being, it's been an interesting exercise and as a result I'm going to be taking a closer look at both the ACAS (the management company will keep the NOLs) and PSEC asset management spins coming in 2015. Are there any others to keep an eye on? Another good year, and I'm pleased to keep my lifetime-to-date IRR above 20% which is my goal over the course of the market cycle(s). I really enjoy the investing process over the proceeds, but if I'm not out performing, might as well consolidate my holdings into index funds and focus more time/energy on my day job. Moving to 2015, my aim is to reduce the number and impact of my mistakes, which will likely mean fewer trades and potentially more diversification, but I'll continue to highlight interesting ideas for the blog, even if they don't make it into my personal account. Missed the opportunity in New Media (NEWM), Fortress has executed nicely on their plan to rollup small local newspapers and basically doubled this year. I might have to change my strict rule against third party management agreements to just a higher hurdle to overcome. I picked the wrong horse in the newspaper spinoff crowd (at least in the short term) with News Corp (NWSA), it's my lowest conviction holding currently, while incredibly cheap on a sum of the parts basis, shareholder returns don't seem to be their top priority. If you listen to CEO Robert Thompson on any of their quarterly calls, its more about story telling, empire building and self promotion than actual business results. I like their assets, but may find a better use for this cash soon. Obviously was a disastrous investment for me, I got a little too excited with REIT conversions and then add the spinoff dynamics with a couple respected hedge funds backing it... turned out to be peak everything in one. Luckily I trimmed some of my position in July at $26.50, but still took a big hit with the downgrade in guidance and rejection of the REIT conversion, and sold everything in October at $12.00, was lucky to avoid the next leg down this week. There's some good discussion in the comments section of my two posts on Civeo, could be an interesting addition to a basket trade of washed out energy names in 2015. Not that I'll likely be participating, need to recalibrate my ability to take the market temperature in commodity industries, have some work do before I'd feel like its in my circle of competence again. 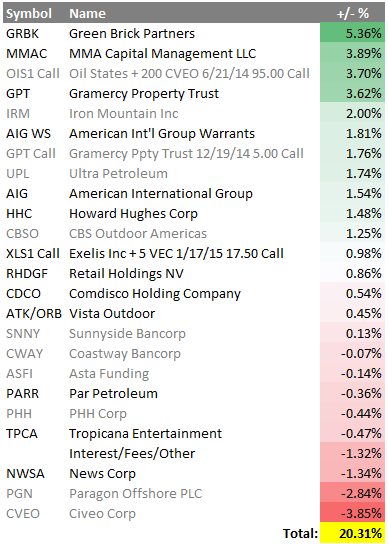 I like the NOL theme right now, most of these companies seem below the radar (or restricted) of larger hedge funds/other investors, and a less crowded theme than spinoffs. I've highlighted a few this year in Green Brick Partners (GRBK), MMA Capital Management (MMAC), Par Petroleum (PARR), Tropicana Entertainment (TPCA), and Cadus Corporation (KDUS). Others that I'm looking at and might blog about in upcoming posts include Signature Group Holdings (SGGH), WMI Holdings (WMIH), and Special Diversified Opportunities (SDOI); Signature has made it's operating company purchase and WMIH and SDOI are still looking at potential acquisitions. It's been a little over a year since I've discussed Tropicana Entertainment on the blog and a lot has happened during that time, but you wouldn't know it if you look at TPCA's stock chart which has done almost nothing for two years now. The illiquidity of the shares is a good mental exercise, it's the equivalent of investing in a private company and you need to look through the stock price feedback loop and analyze the results to determine how the company is really doing. I've discussed Tropicana in the past (here and here), but to briefly recap it's the Carl Icahn controlled gaming company that emerged from bankruptcy in 2010. The company owns 7 casinos mostly in drive up markets across the United States and a small temporary casino located in Aruba. At this point the company is substantially undervalued as moves they've made are starting to pay off and troubles in the industry could yield future acquisition opportunities. Atlantic City has been a mess for years now, the root of the problems stems from increased competition along the east coast, particularly starting in 2006 when the first casino opened in Pennsylvania. Previously Pennsylvania residents would travel across the border and spend money in Atlantic City casinos, now Pennsylvania has passed New Jersey to be the second largest gambling revenue state behind Nevada. Maryland has a bunch of new casinos opening up too and Massachusetts just granted a couple casinos licenses, competition is not going to let up anytime soon, and thus the Atlantic City market has been forced to shrink dramatically. We started 2014 with 12 casinos in Atlantic City, 4 casinos have closed so far (Trump Plaza, Revel, Showboat, and Atlantic Club) and the Trump Taj is likely to make it 5 when it finally shuts its doors in the next month or two (Icahn is Trump Entertainment's largest creditor). The decreased competition has increased foot traffic at Tropicana's flagship Atlantic City casino and resort. The company made a savvy purchase of Atlantic Club's patron database and gaming equipment that has led to increased slot customer volumes (the most predictable kind of gaming revenue). While overall Atlantic City gaming revenue declined 9.3% across the city, Tropicana's casino revenues were up $21 million in Q3 2014 or 33% compared to Q3 2013. New Jersey has also approved the use of $18.8 million in CRDA deposits (otherwise basically restricted cash) and $4.8MM in grant money through the New Jersey Economic Development Authority to invest in the Atlantic City casino, all in, Tropicana is going to spend nearly $40MM upgrading the property while weaker players have been putting off capex and exiting the market. Previously seen a source of risk, the Tropicana Atlantic City has the potential to provide continued upside surprises as the AC market rebalances itself. Another piece of good news happened this past January when the company received $32MM in cash as part of their property tax dispute with the city, previously it was going to be in the form of annual tax credits going out to 2017. A lot of this money will go to upgrading the Atlantic City property, but it also skews the first quarter results so keep that in mind when running your own numbers. Most gaming companies have extensive real estate holdings, and in today's market that means activist pressure to re-evaluate capital structures and spinoff the real estate into a REIT. Penn Gaming (PENN) did a PropCo spinoff of their real estate assets in November 2013 which created Gaming & Leisure Properties Inc (GLPI), a REIT that triple net-leased backed the casinos to Penn Gaming and is pursuing additional acquisitions. Pinnacle Entertainment (PNK) announced plans to spinoff its real estate into a REIT on 11/6/14, activist Orange Capital had been pushing Pinnacle for a REIT conversion since Penn completed the GLPI transaction. Boyd Gaming (BYD), owner of the Borgata in Atlantic City, discussed the possibility of a REIT conversion on 10/30/14 and engaged Greenhill as an adviser. Caesars Entertainment (CZR) announced on 11/18/14 that they've approached their senior lenders about a plan to convert the company's 44 properties (including several in Atlantic City) into a REIT in order to help their over leveraged balance sheet. Caesars is a distressed play at this point, and the REIT conversion would likely be part of a bankruptcy reorganization. A REIT conversion is not an option for Tropicana (but maybe a sale leaseback?) as Icahn's controlling position would violate REIT ownership rules (no one can own more than 10%), but none the less exposes the value in their real estate and signals M&A activity in the sector. Tropicana has a flexible balance sheet, with net debt of only 1x EBITDA, Tropicana has the ability to leverage up and potentially buy up weaker competitors or end up buying the operating casinos after they've split off the real estate. As part of these REIT conversions, each company will be evaluating their casino portfolios and looking to sell assets that don't meet their new strategy for one reason or another. I could see Tropicana as part of it's rollup strategy and strong balance sheet being a natural acquirer in 2015. In addition to owning most of their casinos, Tropicana also owns some other real estate assets including the two luxury hotels in St. Louis that were part of their Lumiere purchase, the HoteLumiere and the Four Seasons, the replacement cost is likely in the $150-200MM range for the combination of the two. They also own "The Quarter" adjacent to their Atlantic City casino, a 200,000 square foot Havana-themed mixed retail development featuring shopping, restaurants, nightclubs and an IMAX theatre, the development cost $285MM to build in 2004, even if its worth just a fraction of that, its still significant when compared to Tropicana's $520MM enterprise value. The best comparable private market value transaction is still the December 2012 purchase of Ameristar by Pinnacle Entertainment for $2.8 billion including the assumption of debt for a 8.4x EBITDA multiple. But Icahn Enterprises (IEP) makes it a little easier coming up with a value by publishing a quarterly NAV estimate which gives a valuation for Tropicana at 7.5x EBITDA, about a turn lower than it's larger more liquid peers which seems appropriate. At 7.5x EBITDA, Tropicana would be worth $27 per share, or about 80% higher than the $15 its trading for today. Of course, we're tied to the hip with Icahn (plus its only a small fraction of IEP) as minority investors and might not see that valuation unless there's a liquidity event. But I also think there's plenty of potential for additional upside, we might start to see improved wage growth in 2015, and in combination with lower gas/energy prices should increase discretionary incomes in Tropicana's middle class demographic market. It might be a stretch, but just maybe with the economic recovery picking up steam, states and municipalities budget's could improve enough to not turn to casinos revenue to plug holes and restore some sanity to the competitive landscape. Even if you have a more cynical view of the industry landscape, Tropicana's valuation provides a nice margin of safety with the benefit of having Carl Icahn, an experienced gaming investor, making the capital allocation decisions and hopefully unloading it at a cyclical top. I have made a few mistakes this year in spinoffs, particularly energy related ones like Civeo and Paragon Offshore (washed out/sold out of both) that looked cheap using past earnings but their futures have been brought in question with the quick drop in oil prices. An upcoming non-energy spinoff, but also one with a potential cyclical earnings top is Vista Outdoor, the ammunition and hunting accessories business of Alliant Techsystems. So before following me into another spinoff consider that risk up front. Alliant Techsystems (ATK) has three main lines of business: aerospace, defense, and sporting goods. 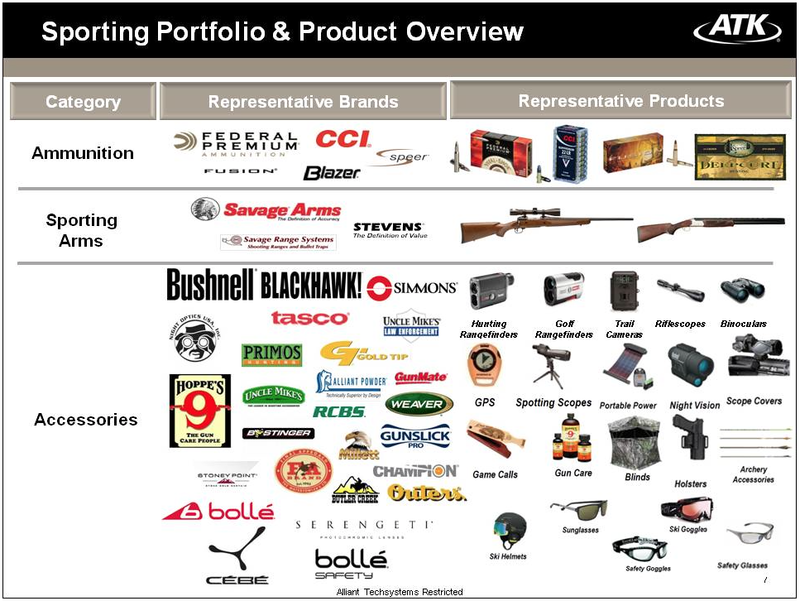 In February 2015, the sporting goods business ("sporting goods" might be a stretch, really ammunition, guns, and hunting accessories with grander plans to diversify) which makes up 39% of ATK's revenue will be spunoff as Vista Outdoor (VSTO) to ATK shareholders, and the remaining aerospace and defense businesses will be merged via a Morris Trust transaction with fellow aerospace and defense contractor Orbital Sciences (ORB) immediately after to form Orbital ATK (OA). The sporting business has seen 15% annual growth for a decade, spurred on even more recently with the "surge" in gun demand due to the real or perceived threat of tighter gun controls under the Obama administration. Only about 10% of their revenues are firearms, so think of Vista Outdoor as more the razor blades piece in the razor/razor blade analogy business model. With the rise in number of guns purchased in recent years, the number of potential customers for Vista to sell ammunition and accessories into has also increased (also good demographics, young males, more females coming into the sector, etc). On April 28, 2014, ATK and Orbital Sciences entered into a deal in which ATK would spinoff Vista Outdoor first, and then merge with Orbital Sciences to form Orbital ATK, original ATK shareholders will own 53.8% of the new company, with Orbital Science's shareholders receiving the other 46.2%. The deal was originally scheduled to close this year, but has been pushed back to February 2015 pending shareholder approval on 1/27 due to a rocket launch failure at Orbital (more on that in a bit). What really makes this transaction work is both entities should be better off afterwards, I don't see a dump transaction taking place here. Orbital trades at a significant premium to ATK, so this deal should be accretive to Orbital shareholders. Institutional and long term investors in ATK should also end up sticking with the new Orbital ATK, ATK has been a defense and aerospace contractor first and foremost for its history, and the new company will remain in the same industry/market cap indexes. The typical spinoff forced selling dynamics don't appear to be at play here. There should also be a number of operational and financial synergies in the new Orbital ATK, the two appear to have a lot of complimentary business lines, natural fit between the two companies that should result in both cost efficiencies and revenue synergies. ATK's CEO Mark DeYoung will be coming over to Vista Outdoor, he's been with ATK since 1985, well before they entered the sporting business space. He lead the push towards sporting and his move to the spinoff is a further sign that Vista is really the crown jewel asset and not a dump transaction. I believe it should end up with a premium market multiple as a niche consumer staple company over the old ATK which as a defense contractor has seen its margins and multiple contract in recent years. Vista will also have limited debt, just $350MM in net debt, or about 1x EBITDA giving it flexibility to make additional acquisitions to diversify away from guns and ammo. ATK acquired Bushnell in 2013 for $935 million in debt (10x EBITDA purchase price), interestingly most of the debt associated with the deal is going to end up on Orbital ATK's balance sheet making the spinoff even more attractive. On October 28th, Orbital Sciences had an Antares rocket explode spectacularly on live TV 14 seconds after launching from NASA's Wallops Flight Facility in Virginia. The rocket is contracted to provide periodic supplying trips to the International Space Station for NASA, although a significant reputational loss, insurance proceeds are supposed to minimize the financial impact of the launch failure. Both Orbital and ATK's shares took a 10-15% hit in the aftermath of the failure as there was concerns the deal would fall through, but both sides have agreed to continue, yet the shares have only partially recovered providing an opportunity to buy Vista Outdoor synthetically even cheaper since the rocket business has no relationship with the sporting business. In the first six months of ATK's fiscal year (starting 4/1/14), the sporting business has done $1.1B in sales, annualizing that figure gets you to $2.2B for the year which is slightly below management forecasts of $2.3B at the time of the spin announcement. Using a 13% EBIT margin and $73MM in annual depreciation, I come up with roughly $360MM in EBITDA. After interest expense and a 35% tax rate, Vista should have about $5.50 per share in projected earnings. What is the market currently valuing Vista at? 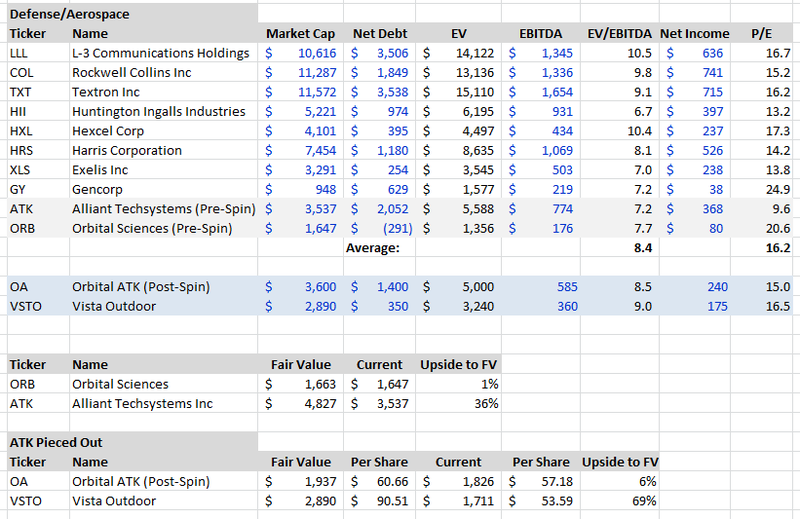 Below is a quick comparables table I built using other mid-to-large capitalization defense and aerospace contractors. If we assume the new stronger Orbital ATK trades at a peer average of 8.5x EBITDA and a market multiple of 15 (and roughly between where ATK and Orbital trade separately), my math shows the current share prices of Orbital and ATK essentially reflecting those valuations. By piecing out ATK, and backing out the Ortibal ATK position, the market is currently valuing VSTO at $53.59 per share, just under a 10 P/E or 5.7x EV/EBITDA. That's pretty cheap for a company with a double digit long term growth rate, but that comes back to the question of peak earnings? Management thinks the slowdown in the gun market should reverse itself in the back half of 2015, there's a decent amount of data to back that up (Black Friday had record gun sales), but just from a big picture viewpoint I can't see America's love affair with guns fading anytime soon? But I could be wrong. I struggled a bit on how to put this position together, the ATK options look a little expensive to my untrained eye, and by my math Vista Outdoor is really the undervalued entity, one can go long 1 share of ATK and short 2.23 shares of ORB to synthetically create a long position in VSTO ahead of the transaction. So that's what I did today, the short ORB will cancel out the shares in OA I receive and will leave me with just the VSTO shares if/when the transaction is completed in February. Within a few months, I would expect VSTO to be trading much higher than the mid-$50s. Hat tip to a reader who brought me this idea.